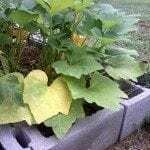 Why do our yellow zucchini squash leaves yellow? One plant will be totally green and the one next to it is yellow. Otherwise, the plant looks healthy.